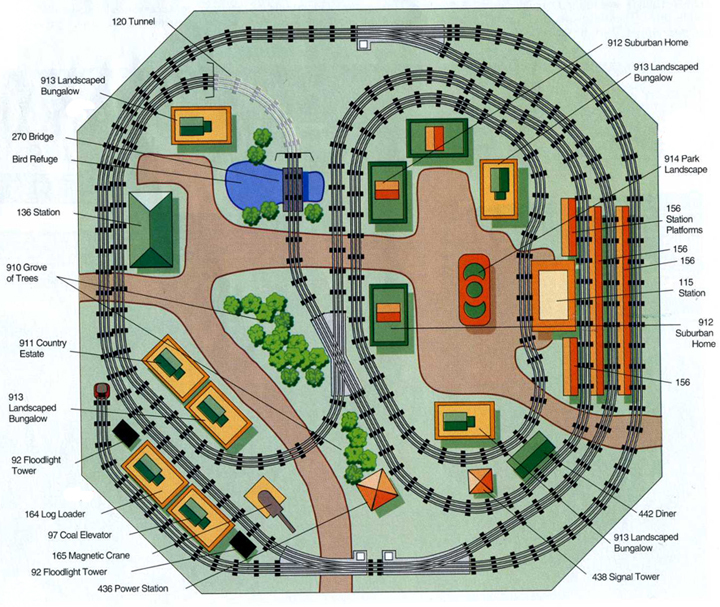 wanted their layouts as be as close to scale and as realistic as possible. 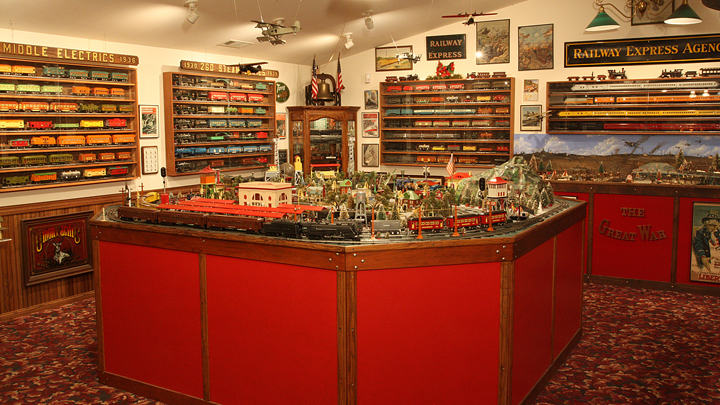 This picture depics the "Lionel O-Gauge" layout, circa 1941. 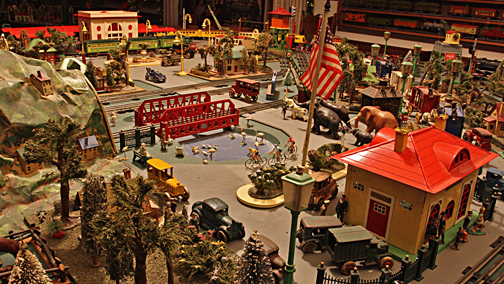 This was the last year of production for almost all toys due to the shortage of materials which were diverted to the war effort. The Bird Refuge in the middle of this scene was inspired by Santa Barbara's railroad tracks alongside the Clark Bird Refuge. You can see an early Circus paradeing through town as well as three bicycles riding around the Bird Refuge. Neighbors getting together to go Carolling at Christmas was common practice back during the WWII period as depicted in this picture. Likewise, milk trucks and ice truck made the rounds delivering their goods. Homes were frequently located right up next to the railroad tracks was common practice. 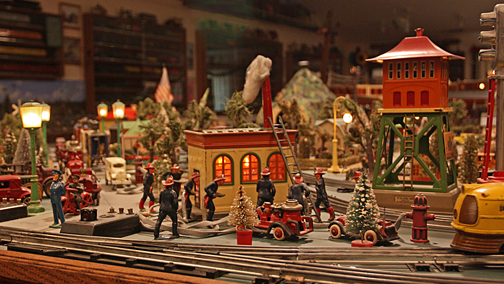 Another view of the "Lionel O-Gauge" layout shows a busy group of Barclay firemen trying to dowse the flames from an uncontrolled blaze in the power house. The Police are holding up traffic while a dog does not understand what all the commotion is about. 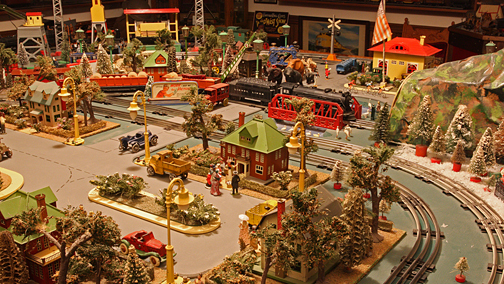 The year must be in the late 30's as we see a Streamlined "City of Devner" about to come into view. 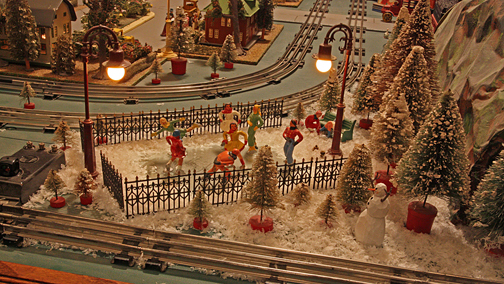 Lionel introduced accessories to kids to extend the play time of train layouts past the Christmas period so to help with after Christmas sales. 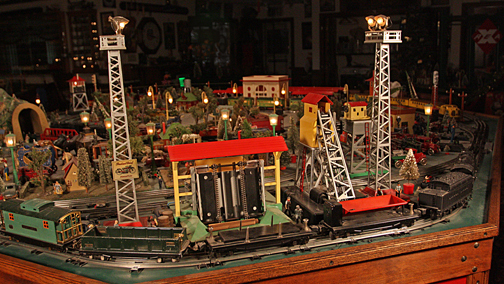 The four largest accessories made between 1938 through 1940 were the: Log Loader, Coal Loader, Magnetic Crane, and Bascule Bridge (not shown). The Automatic Gateman had the most sales even though it was a much smaller accessory. No layout would be complete without some Ice Skaters enjoying some outing at the nearest frozen pond. In this case, it is only a short hike to the base of the mountain were night skating is taking place. It looks like someone has made a Snowman next to the pond!